“We just couldn’t find the back of the net,” said head coach Greg Sutton after the game. “It’s disappointing in the sense that we would’ve loved to get the win, but a point is a point,” he concluded. From the moment the whistle blew, Sutton’s game plan was clear: pressure the ball and leave no space for the opponent to operate. Concordia’s scoring chances multiplied as the team had its first real threat on goal in the 35th minute from the striking right foot of Simon Malaborsa—who had a team-high of six goals last season. Unfazed, the UQTR Patriotes were able to draw first blood due to an untimed jump of the ball from a Stingers midfielder that quickly led to an odd-man rush favouring the opposing side. Stranded, Concordia conceded the first goal and trailed 1-0 with 15 minutes left in the first half. The Stingers refused to let up, creating chance after chance and finally equalizing on a bad turnover from their opponents with midfielder Jorgen Ulloa-Aguilar drilling a highlight worthy goal in the top left corner to level the score at 1-1 just moments later. The momentum shift seemed to spark a fuse for the maroon and gold who dominated the end of the opening frame despite playing two games in three nights. Fairly tested in the first 45 minutes, third-year goalkeeper Karl Gouabe not only gave the crowd reason to cheer, but delivered timely saves in key moments to keep both sides leveled. Heading into the locker rooms with a score deadlocked at one, striker Simon Malabrosa’s veteran attitude rubbed off most of his teammates as the Stingers began the second half with the same energy they left the field with. “We have a lot of rookies this year, we want to make a mentality of never stopping, letting up,” he said. “We know if a team is weak under pressure then we need to exploit that liability”. Much of the second half was played in the midfield area, where both teams shifted the ball from one flank to another eagerly, desperate to break the tie. Last season, Concordia finished just under the Patriotes in sixth position and Algerian freshman and midfielder Syphax Djerroud stressed the importance of winning these games and playing together in order to move forward. “The midfield play allows the ball to circulate, it opens up the wingers and creates opportunities for guys to score, but unfortunately tonight we just failed to capitalize on our attempts” Djerroud said. Near the end of the game, Djerroud was the beneficiary of an elite level counter attack displayed by the Stingers ending with a nifty back heal from Pickering, Ontario native Claude Dufour to Syphax that left him head to head against the goalkeeper but he just hit the post. 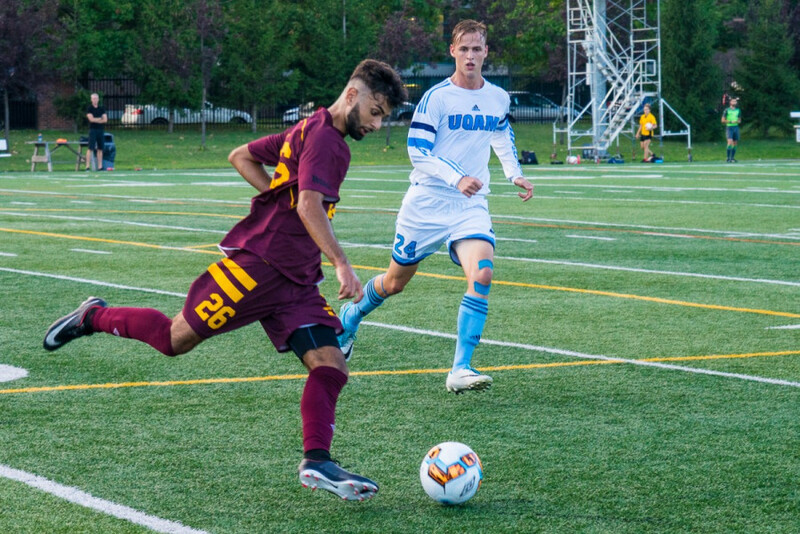 Goal scorer Jorgen Aguilar believes the Stingers made progress from the late scrappy goal they allowed versus UQAM, and remains optimistic of the future and the direction his team is headed in”. The draw might not satisfy the players overall but Master Coach Sutton sheds light on a significant positive in the game against the UQTR Patriotes where his team showed resilience and perseverance. “It’s one thing to not score off your chances but it’s another to just make sure you’re creating them, and at least we did that,” he said. The season—very young, well and alive—leaves the Stingers in a four-way tie for third place after this week’s pair of games. The Stingers look to come away with their first victory as they head to the University of Sherbrooke on Sept. 7 to face off against the Vert-et-Or.